In 1998, Barbara was enlisted by a representative from the British tabloid The Sun to conduct an interview with Diana Spencer, Princess of Wales for the one-year anniversary of her death. While the interview was never published, a project began that truly stretched beyond even the wildest imagination: 12 interviews with some of the most famous figures of the 20th century, all working together for world peace. Party of Twelve presents a fascinating look from Afterlife at a wide range of cultural issues, including domestic abuse as seen by Nicole Brown Simpson, reincarnation and education by Albert Einstein, feminism and abortion by Norma Jean Baker, and gratitude and AIDS by Ryan White, among others. 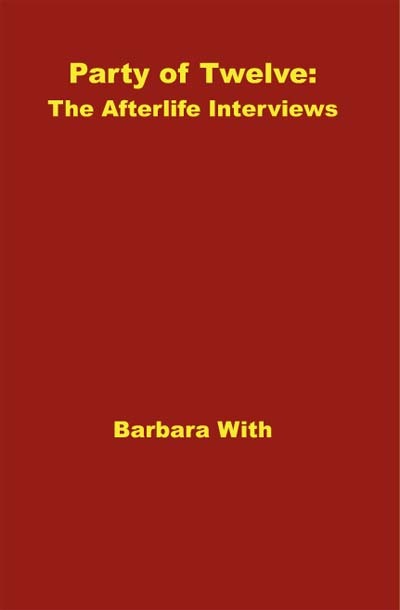 Ending with the Manifesto of the Destiny of World Peace, Party of Twelve: The Afterlife Interviews stimulates your thinking about possibilities for creating peace on our planet and reassures us that we are more powerful than we can possibly dream.